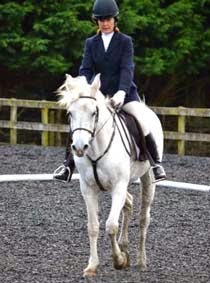 Angel came to us as an 8 year old, having had severe back problems which had led to one of her feet being twisted. She also had a very high wither and was difficult to fit a saddle to. After a combination of physiotherapy and being ridden in a saddle pad, she was getting back to normal. But it was not possible for my mum, who has recently had a hip replacement, to compete with the saddle pad. They needed a saddle that looked the part but was also kind to Angels back. Her owner introduced us to Solution Saddles, and we are now riding all our horses in them! 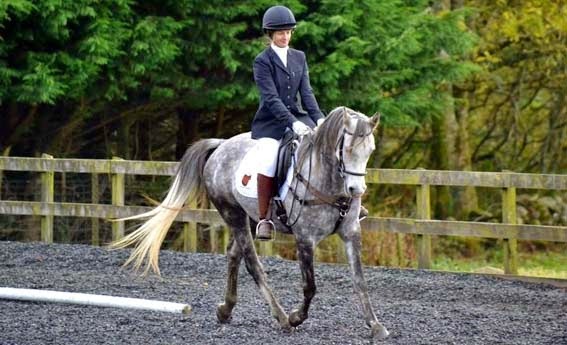 Angel has not had a problem in her SMART saddle and has been successfully competing in dressage and jumping events with it. She's happy, so we're happy. As an added bonus, the SMART RigidFree saddle is the most comfortable saddle we have ever sat on! Mum is now able to enjoy riding, in comfort! Thank you Solution Saddles for making it possible for us to enjoy our horses!